Details Green bice is artificial basic copper carbonate green, sometimes called green verditer (derived from verte de terre). It has the same composition as that of malachite, but the particle structure is different. Artificial basic copper carbonate pigments are mentioned in 17th century literature and was noted in a late-16th century price list. The manufacture of basic copper carbonate was carried out by silver refiners in the 17th century. The process was difficult, slow and somewhat unpredictable, and the resulting hue could vary from an azure blue to a green with a distinctly bluish cast. By the mid-18th century, the ‘refiner’s’ process was replaced by a less expensive manufacturing method. 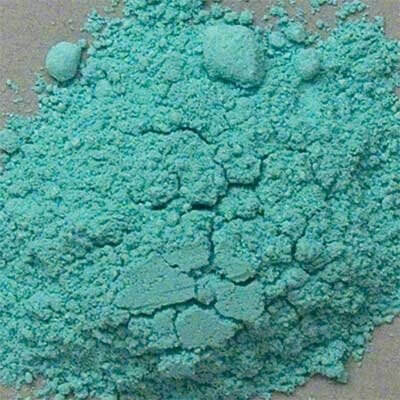 Green verditer is made by pouring a solution of copper nitrate onto chalk (calcium carbonate) after which the pigment washed and dried. In place of the slower ‘refiner’s’ process, copper carbonate may be produced by precipitation from a solution of copper salt, such as vitriol (copper sulfate), by the addition of pearl ash (potassium carbonate). Pigment made using these substances, however, invariably contains a proportion of copper hydroxide. Rublev Green Bice is made according to the latter recipes from the 18th century. Green bice is stable to light and normal atmosphere. It can be used in all vehicles and areas of basic copper carbonate on medieval frescoes are often still fairly bright green. Green bice absorbs a small amount of oil (22 g oil per 100 g of pigment). Grinding green bice will cause its hue to become lighter. Green bice contains cooper, which is rated as toxic from prolonged exposure if inhaled or ingested. 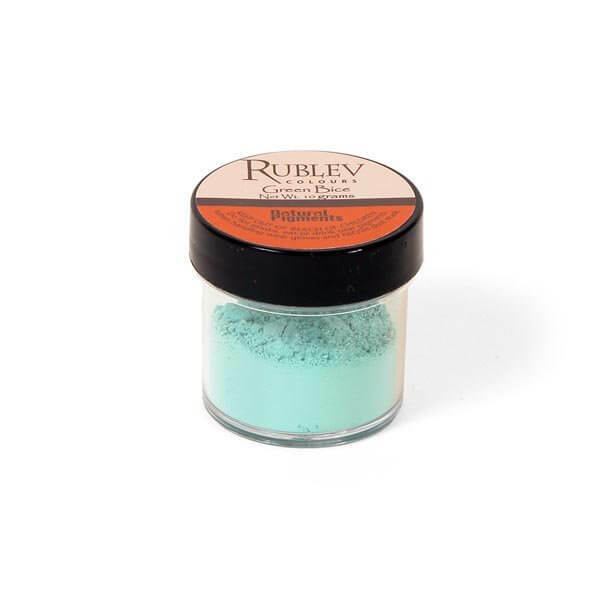 Care should be used in handling the dry powder pigment to avoid inhaling the dust.